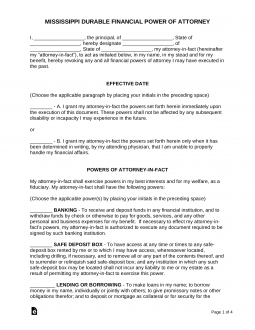 Mississippi Power of Attorney Forms can be used in a variety of scenarios where legally appointing another person to represent you with authority is called for. In other words, the person you appoint will be able use your authority to make decisions and take actions that you would be able to as if he or she were you. This will of course depend on the paperwork used and the information it is supplied with. For instance, a durable power of attorney generally grants power to act on a broad range of financial affairs, such as opening bank accounts, paying bills and receiving payment. Your representative has a statutory duty to act in your best interests, but it is important that someone trustworthy and reliable is chosen for this role. Advance Health Care Directive (Medical POA) – This form is tailored for medical situations where a person is able to appoint another to be their agent for health care decisions. Durable Power of Attorney – This type of form is used for appointing a person to take care of a broad range of financial and other matters. It is often used for estate planning purposes, as it remains in effect (or goes into effect) if and when the principal is determined by a doctor to be unable to make his or her own decisions. Signing Requirements: Not mentioned, but a Notary Public is recommended. General Power of Attorney – Like the durable POA, this type of form is used to appoint a person to act as the principal on a broad range of financial issues. Unlike the durable form, however, it becomes void if and when the principal is determined to be incapable of making his or her own decisions. Minor Child Power of Attorney – This form is used to assist parents who may need to leave their child in the care of another while they are unavailable and want to give that person the power to make decisions for health care and education of their children while they are away. Limited Power of Attorney – This type is used in limited situations such as for a single real estate transaction. It is typically used for those times when a principal is going to be away when the transaction is scheduled to take place. It provides flexibility. Real Estate Power of Attorney – Allows an owner of property to instruct someone else to handle its sale or purchase. Revocation of Power of Attorney – This is an important form to be used to cancel or terminate a POA that is in effect. Tax Power of Attorney (Form 21-002) – This form is needed in those instances that you want your tax professional to obtain information and make tax filings on your behalf. Vehicle Power of Attorney – If you need someone to handle your titling or registration issues for your vehicle, you can use this form.